As we begin 2017, I invite all Episcopalians in the Diocese of Hawaiʻi to read the following books over the course of the year. I think these books could best be read in congregational study groups. These books are not long, but I hope we can read them together in 2017. As you will see, my suggestions are to help focus, as a Diocese and a people of God, on the essentials in 2017: Faith, Justice, Prayer and Compassion. Bishop Rowan Williams, the former Archbishop of Canterbury (2002-2012) and currently Master of Magdalene College, University of Cambridge, offers two accessible introductions to the Christian faith. These books have pastoral reflections followed by questions (for personal reflection or group discussions). These books taken together could be a good basis for preparing candidates for Baptism or Confirmation, but long-time members of the Church have much to gain from them as well. I hope both of these books are read in 2017. Being Christian: Baptism, Bible, Eucharist, Prayer by Rowan Williams (Wm. B. Eerdmans Publishing, 2014), 84 pages. Being Disciples: Essentials of the Christian Life by Rowan Williams (Wm. B. Eerdmans Publishing, 2016), 88 pages. 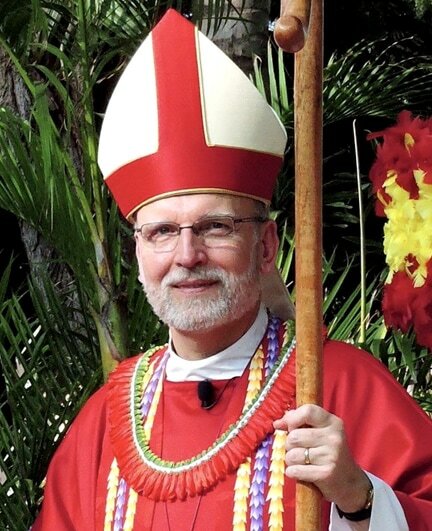 Some will remember that Tex Sample was the keynote speaker during one of our diocesan education weekends at Turtle Bay. Ordained in the United Methodist Church, he is the Robert B. and Kathleen Rogers Professor Emeritus of Church and Society at the St. Paul School of Theology in Kansas City, Missouri. Tex is a story-teller and theologian with a passionate commitment to justice. This reflection on justice, community organizing and faith is timely. I hope it is read by many in our churches. A Christian Justice for the Common Good by Tex Sample (Abingdon Press, 2016), 111 pages. Throughout Advent, I preached and taught about the use of the Examen Prayer. St. Ignatius Loyola (1491-1556) developed this simple form of prayer to nurture a reflective habit of mind that is constantly attuned to God's presence. A Simple Life-Giving Prayer is a personal reflection on and witness to the Examen Prayer by a lay person. Reimagining the Ignatian Examen offers variations on this model of prayer to keep it fresh and focused (there is an app available to support the exercises in this book - see http://www.ignatianspirituality.com/23542/reimagining-examen-app). Certainly, Manney's book is a good beginning. A Simple Life-Giving Prayer: Discovering the Power of St. Ignatius's Examen by Jim Manney (Loyola Press, 2011), 85 pages. Reimagining the Ignatian Examen by Mark E. Thibodeaux (Loyola Press, 2015), 85 pages. Lastly, I am increasingly convinced that compassion is the virtue that is at the heart of the Christian life. It is the force that turns prayer to action. I suggest two books on compassion to help shape our common life. Compassion was originally written in the early 1980s by three Roman Catholic priests. McNeill and Morrison revised it after Nouwen's death to make it more gender-sensitive and to again share a needed voice. Twelve Steps to a Compassionate Life was written from the broader perspective of listening to voices from various religions to expand a person's capacity for compassion. If read in a congregation's study group, please start with Compassion. Compassion: A Reflection on the Christian Life by Henri J.M. Nouwen, Donald P. McNeill and Douglas A. Morrison (Doubleday, 2005), 137 pages. Twelve Steps to a Compassionate Life by Karen Armstrong (Anchor Books, 2010), 193 pages.